Following her attendance at the Globes, Greta Gerwig made her way to the big apple to attend the 2018 National Board of Review Annual Awards Gala at Cipriani 42nd Street last night(January 9th). 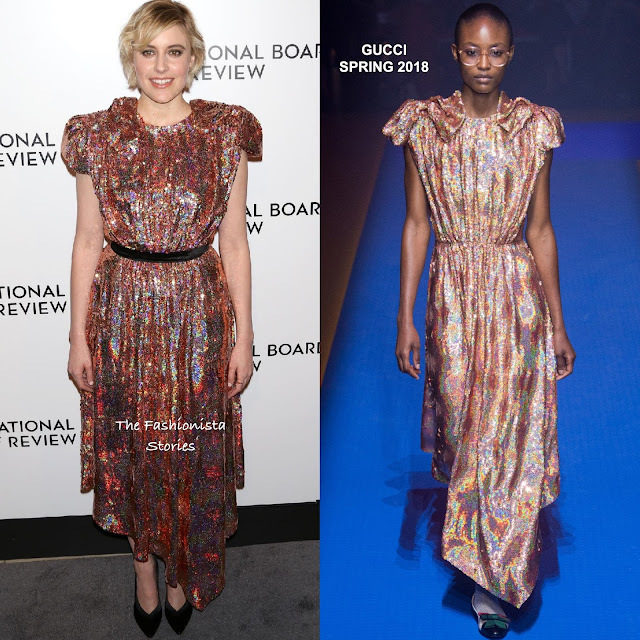 Making a sparkly entrance, she wore a GUCCI SPRING 2018 colorful, iridescent sequin dress which featured statement, bow detail shoulders and a asymmetrical hem. To give her look balance, a belt was added which I think worked in her favor. However I can't say that I am a fan of this dress mainly because of the unflattering shoulders. But kudos to Greta for always taking a fashion risk because this is right up her style alley. She finished up with CARTIER jewelry and GIANVITO ROSSI heels.